The Bulgarian Herb Fair took place on November 6 and 7, 2015 in the Agricultural University, Plovdiv. The forum was the culmination of the campaign for popularization of sustainable medicinal plant use in Bulgaria of Foundation Information and Nature Conservation, co-funded by the European Commission, through LIFE+. The goal of the event was to attract the support of the Bulgarian public for the protection and sustainable use of medicinal plants in the country. We disseminated information about Bulgarian herbs, through the media and social networks and popularized the work of hundreds of herb collectors as well as that of everyone involved in the sourcing and processing of this invaluable natural resource. 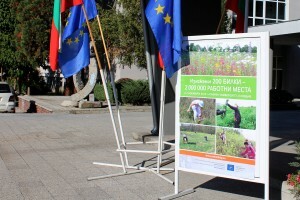 An exhibition titled: „200 Herbs – 2 Million Jobs “ where Bulgarian producers exhibited products from local herbs on their stands, thereby showing that the vision of experts from the sector, that medicinal plants can give livelihood to a quarter of our nation if used wisely and protected in their wild habitats, is a real possibility. Consultation sessions for farmers organised in cooperation with the National Agricultural Advisory Service where all interested parties received consultations about the cultivation of medicinal plants from experts in the field. A discussion themed “Partnerships for the intelligent use of medicinal plant resources in Bulgaria” with representatives of all parties, interested in the conservation and sustainable use of Bulgaria’s medicinal plants. A conference session with the participation of experts from the Ministry of Environment and Water, The Executive Environment Agency, The National Agricultural Advisory Service, The Institutes of Biodiversity and Ecosystem Research and Organic Chemistry of the Bulgarian Academy of Science, among others. Screenings of the newly premiered film “The Medicinal Gold of Bulgaria” and other films about Bulgarian medicinal plants. An exposition of information boards themed “Herbs Are a Source of Life”, created by Plovdiv schoolchildren. The folklore ensemble “Iglika” (Primula), part of the Municipal Children’s Center in Plovdiv, led by Ventzislava Elenska and Dimitar Petrov, presented dances and customs, connected to medicinal plants. The children from invited the visitors to the fair’s opening ceremony to pass under the “Enyovden” wreath for health and prosperity. Tourist Complex Diana from Trud village treated the guests to herb bread and deserts. The Agricultural University was the most wonderful host for this celebration for all those dedicated to working with medicinal plants. The university offered its hall, equipment and assistance in the welcoming and registration of the participants and visitors to the fair, as well as its overall friendly support and created a festive spirit with the performance of its dance club Trakiyska Mladost (Thracian Youth). The foyers of the University became “Herb Fields” for two days, one of the auditoriums transformed into “Linden Blossom” Hall and another became “Water Avens” Hall. More than 500 people visited the stands, watched films in Cinema Hall “Nettle” and most asked when the next Herb Fair would take place!